This 2011 album, brought together three talents: Willie Nelson, a singer songwriter, interpreter of many, and someone who skirts in styles across country, blues and others; Wynton Marsalis and his jazz band; and Norah Jones, who has a singing career as a smooth jazz/pop singer. There was also the collaboration of Ray Charles through his songs. I have yet to become a fan of Norah Jones as I find most her work just far too sweet and smooth. But on this album she shines; when she is allowed to, as the other two do dominate. I have taken this album out to play and have done so many times since. It has definitely grown on me and is just right for being at home with winter closing in around outside. Willie Nelson is great, especially when considering his age then, being a young 77. His voice is still holding out although one reviewer who recently went to a concert said his voice was starting to show its age. Norah Jones and Willie Nelson combine wonderfully on a several tracks. All in all the band and Wynton Marsalis have a lot of fun providing competition and collaboration with the two singers. 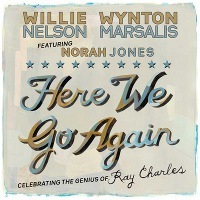 The combination of talents, being Willie, Norah, Wynton, his band and of course Ray Charles, is to be enjoyed. I would suggest that the audiences would have totally enjoyed the cool laid-back concerts with Willie Nelson doing songs slightly outside his normal work of late. The whole album is definitely something they all loved doing and Ray Charles would have been proud. Ray Charles of course took on country music in 1962 with his now famous albums of interpreting country music. Which then took me to seek out copies of those Ray Charles’ famous albums, Modern Sounds In Country & Western Volume One & Two (1962). So please stand-by for a review of those original Ray Charles’s albums. So yes, if you have some time at home or driving in the car and want to listen to some laid back and well produced revisiting of some of Ray Charles work, get a copy of Here We Go Again: Celebrating the Genius of Ray Charles (2011). One final note, in looking through Norah Jones’ latest releases, I came across a 2013 album devoted to the Everly Brothers: Billie Joe Armstrong & Norah Jones – Foreverly Album. Looked interesting especially for one whose background included growing up with Everly Brothers music. More soon maybe on this one.